Blues legend and multi-talented Little Milton Campbell died August 4, 2005. As fans of "the man", lets celebrate his memory and make it our duty to keep his music playing around the world for all to enjoy. 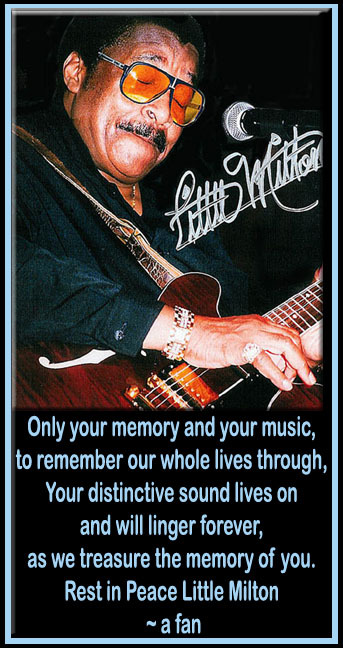 In honor of Little Milton, have his music played ... Call your radio stations and specifically request his music. "Hey! Hey! The Blues is Alright. If that's not THE bonafied "blues anthem"
Grits ain't Groceries and Mona Lisa was a man! We ran out of Little Milton's "Think of Me" CD a few weeks ago and ordered more. Our order just came in so please ... help yourself to some Little Milton! Always click the "Exclusive" tab at the top of the page to see what new exclusive item has been added to the store. 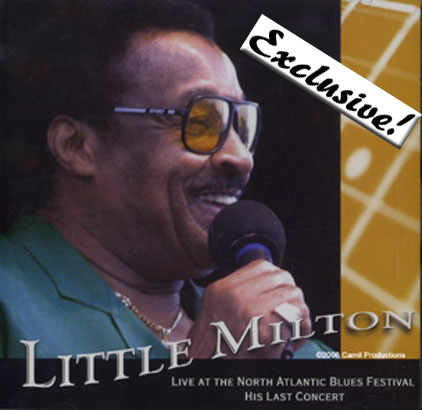 Little Milton's Last Live Concert Performance, fortuitously filmed and recorded during his last concert, with no idea it would be the legend's last.